The young audiences arm of the prestigious Galway Film Fleadh moves into the recently renovated Pálás Theatre for the upcoming festival. The programme of cinema for the 2018 Junior Film Fleadh has increased this year, with films running all day from Tuesday 6th – Saturday 10th November. This year’s Junior Film Fleadh will present some highly anticipated new fiction films and documentaries. ‘Skate Kitchen’ is the first fiction film from Crystal Moselle, who directed the critically acclaimed 2015 documentary, ‘The Wolfpack’. ‘Skate Kitchen’ stars the members of a real life all-girl skate crew in New York, who caught the director’s attention on social media and inspired the film. Established names rounding out the cast are Jaden Smith (‘The Pursuit of Happiness’, ‘The Karate Kid’) and Elizabeth Rodriguez (‘Orange is The New Black’). ‘Eighth Grade’ is the feature directing debut of comedian Bo Burnham, who was inspired by his own school struggles with anxiety, and cast lead actress Elsie Fisher after he noticed her on YouTube. After the film was given an unfair ‘R’ rating, free public screenings of ‘Eighth Grade’ were organised in all fifty states in the U.S. by distributor A24, who were determined that young people should be able to see it. ‘Metal Heart’ is a new, Irish coming-of-age dramedy about twins sisters Emma and Chantal, whose sibling rivalry threatens to boil over when they’re left alone for the summer. ‘Metal Heart’ is the feature directing debut of Irish actor Hugh O’Conor (‘Handsome Devil’, ‘Mary Shelley’) and stars the Galway Film Fleadh’s 2018 Bingham Ray New Talent Award winner Jordanne Jones, who will both present the film and discuss with the audience after the screening. The documentary ‘Amal’ embarks on a 6 year compelling journey from childhood to adulthood with a feisty teenager growing up in post-revolution Egypt. Amal enjoys playing soccer and going to protest marches with her friends, amidst constant political turmoil. Amal learns the limitations of a patriarchal society, while searching for her place, identity and sexuality in an Arab police state. There will be a hugely enjoyable programme of classic films – to be revisited, or discovered for the first time – that contextualises the teen movie and its history. Films like ‘Rebel Without a Cause’ (1955), starring James Dean in his most famous and final role; George Lucas’s forerunner to Star Wars, ‘American Graffiti’ (1973), and more, will all be celebrated as early examples of teenage representation in Hollywood. While Richard Linklater’s 1993 modern classic ‘Dazed and Confused’ will be rolled out to celebrate 25 years since it was released with its ensemble cast of up-and-comers: Ben Affleck, Matthew McConaughey, Parker Posey and Milla Jovovich. The classic film programme will run each evening at the Pálás from 8:30pm. The Junior Film Fleadh kicks off its Saturday programming with a big-screen presentation of the cult classic 'Batman: Mask of the Phantasm’, 25 years after its release. Spinning out of the success of the 90's television series, this modern classic of animation became a sleeper hit after years of home video distribution. It will be preceded by the animated short, ‘The Mechanical Monsters’, one of seventeen Technicolor Superman films produced by Fleischer Studios in the 1940’s, which had a huge influence on future animators, including the makers of ‘Batman: Mask of the Phantasm’. 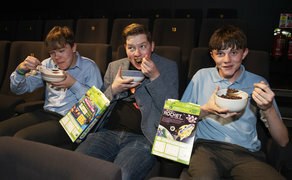 The Junior Film Fleadh will continue to fulfil its education remit, with school bookings available for French, German and Spanish language films on Tuesday - Thursday mornings, followed by Irish language and social education films playing in the afternoon. These include films like ‘Around Here’, a rural Irish coming-of-age drama, exploring themes of mental health. ‘Around Here’ will be presented by director Martin Beirne who will be on hand for discussion after the screening. And Director Jim Sheridan (My Left Foot, In America) will present ‘Shelter Me’, a fly-on-the-wall documentary about the take-over of Apollo House in Dublin on Christmas 2016. An insightful look at Ireland’s homelessness crisis, Sheridan produced and stars in the documentary, and will take part in a post-screening Q+A. Click here for the full line-up of feature films, short films and filmmaking workshops taking place at the 2018 Junior Film Fleadh. The Junior Film Fleadh takes place from November 6th– 10th at Pálás, Galway.